The Tactile Universe has been developed by the University's Institute of Cosmology and Gravitation to engage the blind and visually impaired community with astrophysics research. It involves a series of 3-D printed images of galaxies that allow blind and visually impaired children to 'see' the universe by feeling the shapes of these astronomical objects. Project lead and visually impaired astronomer Dr. Nicolas Bonne said, "I've had my eye condition from birth, and I decided that I wanted to be an astronomer at the very young age of 5. My parents and teachers were pretty supportive and they did everything that they could to help me learn about what is fundamentally a very visual science. This wasn't always easy though, and this was often due to limited accessible astronomy resources for people with vision impairments. "In astronomy books and TV shows, whenever anybody wants to talk about how awe inspiring the universe is, they tend to show beautiful pictures of space to make their point. I wanted to make something that could help to inspire and teach people in the same way, regardless of whether they can see or not." Dr. Bonne and his colleagues print 3-D galaxies by scaling their brightness vertically, this means that the brighter parts of galaxies are higher. Participants touch the 3-D models to learn about different astronomy concepts such as galaxy shapes and the colour of their stars, and what they can tell us about galaxy formation and evolution. The project began in July 2016, and since 2017 it has been engaging children in two Hampshire schools with a resource provision for pupils with visual impairment—Toynbee School in Chandler's Ford and Kings Copse Primary School in Hedge End. The Tactile Universe has recently received a prestigious £45,000 Nucleus Award from the Science and Technology Facilities Council (STFC) to make their resources available free of charge to the wider astronomy outreach and blind and visually impaired communities, for use in school lessons and at community family events across the UK. The funding success was thanks to the team developing partnerships with the Royal National Institute of Blind People (RNIB), the Royal Astronomical Society, the South East Physics Network (SEPnet) and The Ogden Trust. 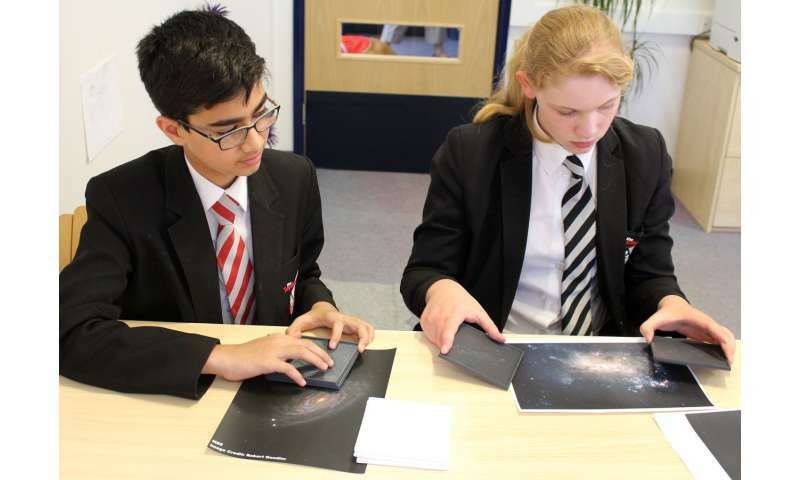 Dr. Jen Gupta, Public Engagement and Outreach Manager for the Institute of Cosmology and Gravitation, said: "It has been great working in local schools and seeing how much the pupils have got out of our Tactile universe activities, regardless of their level of vision. I'm delighted that the significance of the project has been recognised by STFC through this funding, and can't wait to help make astronomy accessible to any child with a vision impairment in the UK and beyond." Dr. Coleman Krawczyk, Technical Lead for the Tactile universe, added: "The Tactile Universe is the most rewarding project I have been a part of. I'm excited that this funding means that the tools we've developed can be used to make astronomy accessible to children with vision impairments for years to come."